I had forgotten how important a well tooled and supplied workshop can be to efficient model and prop building! I had taken for granted the quality of the shop when I was at Cascade Pictures, or the one in my own studio. Unfortunately when I went to work on Star Trek and got immersed in the digital world, I let my tools go to others. Now, what should have been straight forward tool cuts became laborious chew-it-out-with-my-teeth kind of endeavors. So it was off to the hardware store for power tools and support supplies! Hey, I wanted to eventually have a “workshop” in my garage anyway! This was a great project to motivate me to get that shop together. 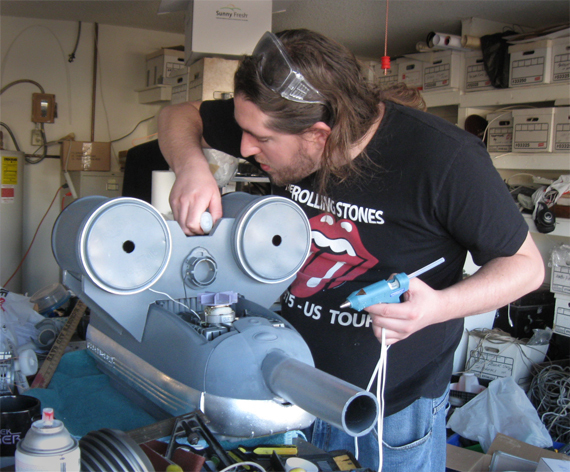 As Nate and I talked to the director, Nathan Blackwell, the Death Ray developed into a more visually active prop. We all agreed that blinking lights or some sort of a “power chamber” would be visually exciting. I was excited to amp this prop up a notch or two. As I began researching lighting equipment, my next big realization was that much had changed since I was last building props professionally! I guess that is a “Duh…” but it did hit me kinda hard; I had to rethink my approach to lighting this thing. I was restricted by available space in the prop for lighting and had limited budget. Much of the miniature lighting had gone to LED units and the controls were electronic now. 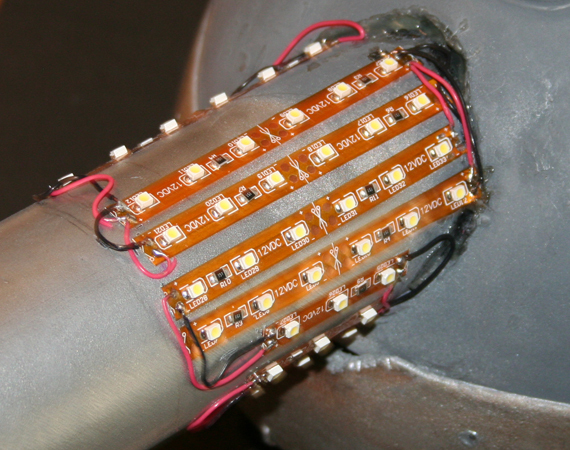 No more ‘grain of wheat’ bulbs wired to micro switches mounted on rotating cam banks! 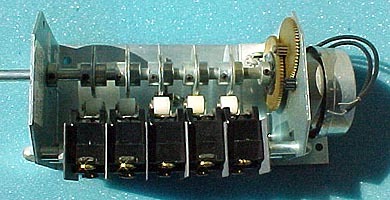 Micro switches on a motorizes cam bank. The ol' fashoned way! I was an old’ electro mechanical kind of guy; this electronic stuff was going to challenge me a bit. Lucky for me, right here in Phoenix was a really cool company, Jeco Glasscraft http://www.jecoglass.com/originalleds.html Their sister company, Phoenix Lights, supplied LED light strips, power supplies and plugs, and most important, some personal one-on-one instruction from Jess, the owner! After a visit to Jeco I was set for tight quarter lighting solutions. I had the option of soldering it together myself or getting it pre built. I chose to solder it together myself. I probably won’t do that again; not because it was a difficult kit, it was quite easy. But again I am used to screws, lugs and cams and those solder points on that circuit board were SO tiny! One of the first construction concerns was to add some height and bulk to the Electrolux vacuum body. I fabricated a sloped sided box under the vac. While trying to save on costs, I used plywood reinforced with 1×2 furring strips. On retrospect, not such a good idea. As the electrical and lighting complexity grew, I ran into issues of splintering surfaces and 1×2 strips where I wanted to mount switches. 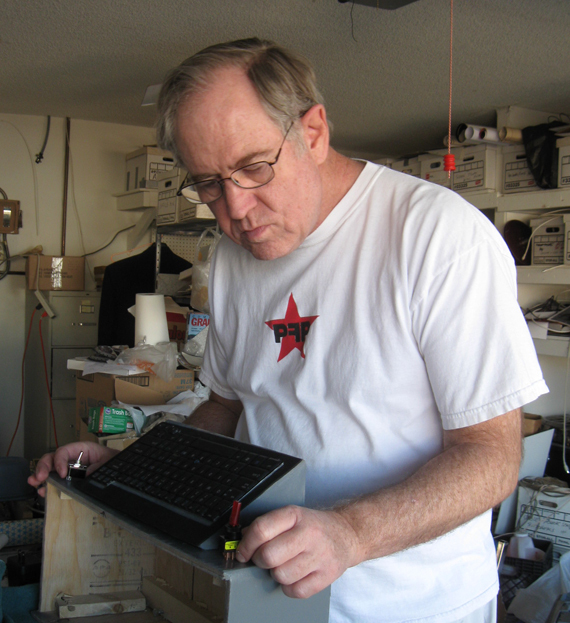 I had to live with it so, to this plywood box, I added an old laptop keyboard that my son, Nate, had squirreled away. Adding a keyboard and trying switch positions. I had to get away from plywood for more complicated shapes. Knowing the filming needs, I adopted some ½ inch gator board to hold the two former coffee canisters on top of the weapon. With my teaching responsibilities I could see that I might need some help to meet the deadline. I asked my friend Diane Cook to help with the construction. Diane has a fine history of costuming and semi-pro prop building. http://kitchencostuming.com/archives/category/props Diane also has a fine color eye for matching paints and has quality craftsmanship. 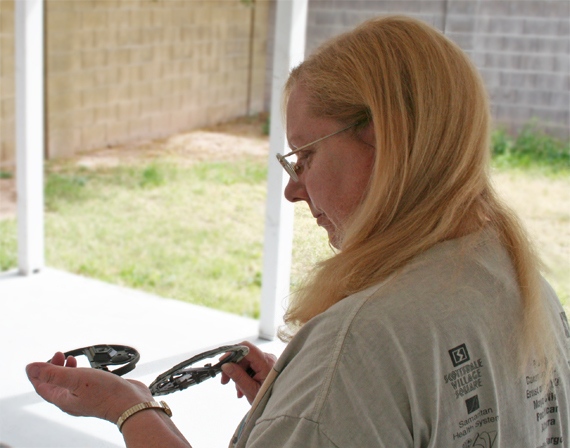 Diane Cook inspecting paint work. She has done a lot of the painting and aging of the weapon and its details. 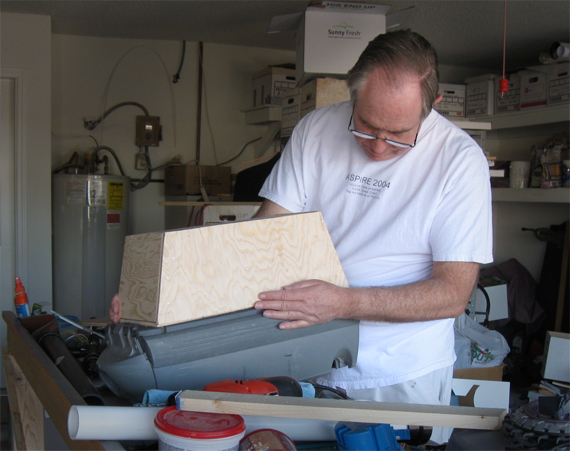 Diane also introduced me to a fantastic, low cost craft material that we put to use in a number of ways on this prop. Great stuff! It makes me want to go build my own ‘death ray’. What tools did you outfit yourself with to do this job? (602) 254-0613 ). It’s a huge warehouse and yard filled with old mechanical and electronic ephemera. Think “Sanford and Son”. Thank you for the surplus resource! This looks like an amazing project Mr. Stipes! And it looks like it is turning out really nicely! Can’t wait to see the final product! I’ll bring the steel and the ball bearings!